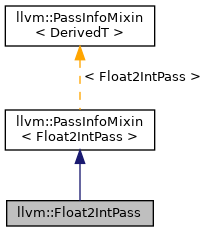 Definition at line 24 of file Float2Int.h. Definition at line 516 of file Float2Int.cpp. References llvm::PreservedAnalyses::all(), llvm::PreservedAnalyses::preserve(), llvm::PreservedAnalyses::preserveSet(), and runImpl(). Definition at line 492 of file Float2Int.cpp. References cleanup(), llvm::SmallPtrSetImplBase::clear(), llvm::dbgs(), llvm::Module::getContext(), llvm::Value::getName(), llvm::GlobalValue::getParent(), LLVM_DEBUG, and Modified.